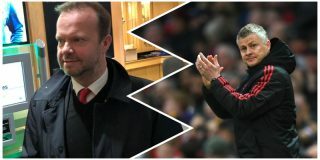 Ed Woodward reportedly laughed off a question about Manchester United’s managerial plans ahead of their FA Cup defeat to Wolves on Saturday. The club’s executive vice-chairman was at Molineux Stadium as United crashed out of the FA Cup with a 2-1 defeat. Marcus Rashford netted a late consolation goal but Wolves duo Raul Jimenez and Diogo Jota had done enough in front of goal to ensure progression to the semi-finals. The defeat put a dint in any hopes of silverware for United this season, but it shouldn’t change the fact Solskjaer is favourite for the job. However, United are yet to officially announce who will be manager beyond this season. Everyone thinks it will be Solskjaer but who knows if the Reds go on to dip between now and the end of the season? April is going to be a tricky month for the Norwegian coach. Norwegian reporter Jonas M. Rye noted how Woodward laughed when he was asked if he had a permanent manager ready. Unfortunately, the reporter was unable to get any quotes on the issue, but who else could United appoint at this point? Talk of Mauricio Pochettino coming in has quenched and Zinedine Zidane returned to Real Madrid last week. I don’t think United will change their mind on Solskjaer. It’s his own fault expectations are bigger than they were and that should be a considered a good thing as more is expected of the players and how we finish the season. Solskjaer has always wanted his players to take responsibility. To be Manchester United players.